I was dropping my 7 year old daughter off to her father's house yesturday, my daughter's father has recently let his friend and 2 german shepherds move in. As I was leaving I went to give my daughter a hug and kiss good bye and one of the german shepherds bit my arm broke the skin as well. I left to seek medical attention and took my daughter with me due to the fact that I dont want her to get bit. Her father said later that the dog was protecting and that is why he bit me, but I am afraid for my daughter, I dont want the dog to bite her or anyone else and it be even worse than the bite he gave me. Should I request that the dog be removed from the home before letting my daughter go back or is this something that I dont need to be concerned about? It is so hard for me to give you advice about this especially since I wasn't there. Now I'm not saying don't be concerned, but I am saying don't get totally carried away that the dog bit you and transfer that worry to your daughter. If she is comfortable being around these dogs, and dogs in general, you don't want to change that to being fearful of dogs. But I am glad you went to get treatment after being bitten. I hope by now you have had a chance to discuss things further with your husband. There could be several reasons why the dog bit you but in any case getting bitten is not a great sign overall and can be quite traumatic. I assume the dog was fully vaccinated but make sure for your own soundness of mind. Some dogs bite - that's just the way it is unfortunately. German Shepherds too - though typically in my experience the little dogs are the ones that seem to want to get me the most often. But German Shepherds are big and a bite from one of these guys can be scary and painful and traumatic. But it sounds as though the dogs only bit you once and maybe in reaction to something that you did (even though you are not aware of what it was) - if the dog seriously wanted to do you some harm, a full grown German Shepherd could easily do that. But I would be aware of the dogs behavior in the future - and would suggest you going back there to visit the dogs and your husband, etc. and to access the dogs acceptance of you - all under complete supervision of your husband and the dogs owner. If you're worried for your daughter during this meetup then, depending on her age, leave her in the car, have her wait outside/stay with a friend or relative or in another room as you do this. You need to be comfortable in this situation and you need to feel that there is no threat to your child from the dog. Now I have been bitten by other dogs a few times myself - it's not fun but you can't let it destroy you mentally around the dog. If it picks up that you're afraid of it or scared in any way then that is not a position that you want to be in. I don't know the dog in question here but some animals can be bullies - just like people. And if they think you are weaker than them, well sometimes that can be a problem too. But in many cases something like this happens so fast and it is a one time only happening and the dog meant you no real harm - it was just a warning to you. A reaction to stimuli. And then the dog forgets all about it once it's all over - even though you won't. So when you meet the dogs (especially the one that bit you) be confident, bold and even a little "cold" to it. Pretend that you're royalty and have that kind of aloof attitude - let them check you out when you feel comfortable with them. But just make sure that the owner and your husband are there to help you since they obviously know the dogs. Try to figure out the circumstances of what was happening just before the bite took place and maybe the three of you can actually figure out what made the dog do what it did. But if the dog has no history of biting I don't think I would be totally worried about it - but I would be aware of your actions around it in the future. And who knows, maybe you guys can make up and be the best of friends. That is definitely what I hope for you all - good luck. I agree with the comment from the person who told you that a German Shepherd Dog would usually go between the child and what the dog felt was unsafe for the child. Also the dogs are new to the house and you were a stranger to them. The comment "you were nipped not bitten" was correct. 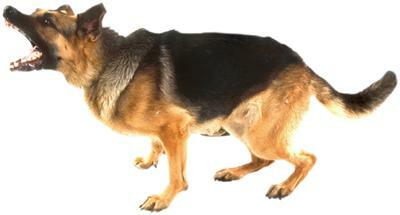 If you were bitten by a German Shepherd Dog, you would have been hurt more than you were. It sounds like you were nipped, not to say that is ok. I would make sure the dogs were put away when the child is visiting until you are satisfied that the dogs temperment is sound. Then introduce the child and stay there yourself for the first few visits or until you feel secure leaving your child with the dogs. It could be a dangerous situation if there is an "off" temperment as the other dog could follow the first ones actions. After breeding this breed for over 40 years I can tell you that none of my dogs have ever nipped or bit anyone. I would not trust this animal at all, saying that this breed does have a tendency to protect the young. Temperament is paramount and a shepherd should never attack a stranger only stand between the stranger and child. Read the breed standard and it say's all. No child should be left with dogs alone any dog not just a shepherd. The most vicouse dog I ever owned was my daughters Chi and that dog would attacked and dog. So In my opinion I would never leave a child with this dog alone. If that cannot be so then never leave the child whilst the dog is at home. First and foremost you were not bitten!!!!!!!!! You was nipped!! I've been bitten, I've been nipped and I had a finger bitten off and in all occassions it was my fault. If you were bitten by any big dog I assure you it would have been down to the bone. This dog has a natural instinct to protect children and I'll bet this is why you got nipped, but you was not bitten. My advice is to learn about the breed and of course be causious with yourself and your daughter. Also I would say watch a little of the Ceasar Milan show and learn about mood and what it plays in interaction with dogs in general. I personally have lived with a pack of 6 to 7 German Shepherd Dogs at a time over the last 20+ years and if you are not the AlPHA dog in the pack you are in trouble. They don't need to fear you they just need to respect you. In conclusion realize that this dog was most likely protecting your daughter. They love kids! Beware however that accidents can and do happen and can have a bad ending. Learn the breed! No bad shepherds, just owners and strangers. Make peace and give each other space.